My purpose in this post is to say why the spectrum is worth thinking about when preparing students for learning. Until online learning materials are produced by teachers raised entirely in online learning environments, the work of instructional designers for the web will likely be tethered, scented, seasoned with legacies of face-to-face classroom teaching and the values and meanings attached to classroom learning. With what are we likely to be obsessed years from now when compensating for eye contact and intonation no longer matters? The time can’t be so far away. Last year – the year of the MOOC – the ten per cent of students who finished massive open online courses and the three per cent who passed were held up as evidence of MOOCs’ thin, pale, weak, lame potential for adequately preparing participants for professional life. I find it remarkable that the numbers were so high. It takes a dozen years of education to train students to follow tracks, take courses, choose paths, climb grades from wherever they are to where they want to be. It’s K-12 chutes and ladders. But in the very first MOOCs a chunk of the population figured out ways to learn within weeks without the motivations of a live instructor, a credit-granting institution, or a student loan deferment countdown. 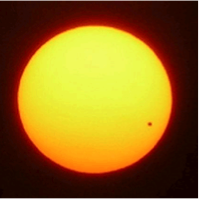 When some students can learn without the chute of a major or the ladder of prescribed courses, the human potential realized in higher education as we know it looks a lot like Venus when it passes between Earth and sun: awe-inspiring in its own right but part of a really big unexplored system. When the 90-97% learn how the other decimals did it – when the next Piaget or Vygotsky figures it out and explains it to the rest of us – when we’re no longer making comparisons between virtual and volumetric domains for learning – we will have taken a leap forward in helping students learn how to learn. What Happens When Novice Learners Watch Expert Learners Learn? PLNs and MOOCs give Expert Learners and Novice Learners opportunities to learn together, and I’m wondering what happens when novice learners watch expert learners learn. Expert Learners make moves that seem risky to many novices – expressing ignorance, asking questions, improvisationally exploring questions with trust that the process by itself can be as fruitful as arriving at an answer. Novice Learners hold fast to unexpressed assumptions, trust ignorance and expedience until they experience alternatives. Recognizing patterns that Novice Learners can’t yet see. Organizing ideas around core concepts. Using information or knowledge in different ways depending on context. Sometimes being better at using or applying knowledge than at teaching it (National 2000). when confronted with a glowing mass of information, learners of all experience levels must know how to discern powers of relevance and value among relationships, ideas, content resources, social networks, and the great ball of knowledge that spews information in all directions. Evaluation is necessary to the search, storage, and retrieval of information in a connected learning environment because learning artifacts radiate then fuse into undifferentiated masses of data unless learners have a strategy for managing them. While taking part in a MOOC entitled Current/Future State of Higher Education 2012 (CFHE12) the need to filter channels and volumes of information arose early in the course when contributions – blogs, tweets, chats, links to resources posted by those enrolled – multiplied by a factor of 1450 – the number of fellow travellers worldwide. With a filter of the smaller Cultivating Change (CCMOOC) community of interested colleagues, we were able to manage the intellectual energy of a smaller learning network of one to two dozen. In a connected learning environment, a manageable Personal Learning Network is an invaluable asset to notice and expert learners alike. Let’s call it a blast shield. 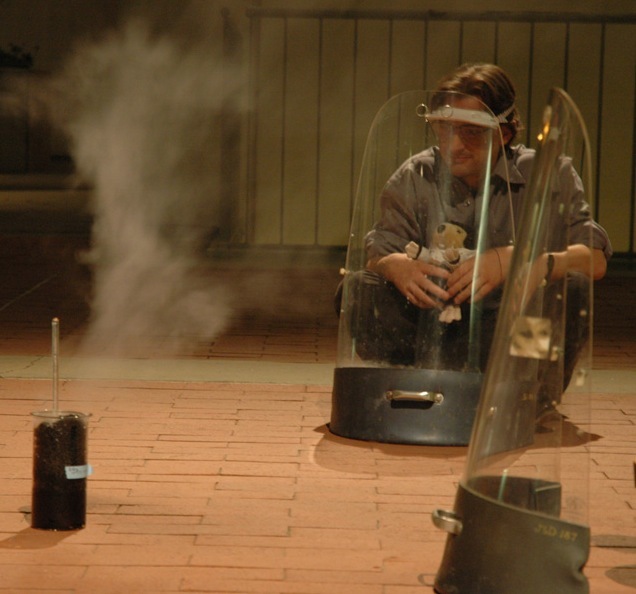 Interactive Chemistry Class – a Blast Shield moment at Scripps College. In a synthesis of literature review, interviews, and surveys of practicing professionals, the findings of Rajagopal et al (2012) suggest to the problem of defending against irradiation by undifferentiated knowledge a useful starting point for designing a simple knowledge management tool for connected learning. The researchers ask how individuals manage their personal professional networks – how they go about networking in the time-honored sense of making connections in order to further one’s professional ambitions. Then they deliver a model for building learning networks out of strategies they found for building professional networks. To defend against ozone holes. It’s as deathly to have too many trusted learning resources as it is to be exposed to too much information. Evaluating your personal learning network is foundational to building one and keeping the shield patched up. To have some relatively objective metric (a numerical value) for evaluation. In the doc, which you’ll have to copy to your Google Drive before you can use it, start by naming a learning interest and listing resources that foster it. A learning interest is fostered by sources of information relevant to it and by receptivity to your – and others’ – interest in it. At the time of my participation in CFHE12, the CCMOOC community was a rich source of new information and of response to my posts. Responses affirmed my interest while challenging me to take others’ interest in it into consideration. You will see in the Google sheet that my CCMOOC example earned high ratings in my PLN at that time. As a reminder: PLNS are right now – not what they were, not what you hope for as in the time-honored sense of making connections in order to further one’s professional ambitions. And, as I repeat on purpose, when you approach them with specific learning interests, they increase in specific gravity. Right now we are using PLNs in the MS Program in Scientific and Technical Communication to ask students to reflect on the sources of learning they count on when pursuing a learning interest. Sources students name typically include professors, books, classmates, and supervisors, among others. This spreadsheet tool – with its suggestion to list points on the learning network in categories such as colleagues, organizations, social networks, subscriptions, RSS feeds, bloggers, and family – is meant to ask students to think expansively about the who, what, when, where, why, and how of their learning. The eight criteria in the shared Google sheet for evaluating those points helps students sort, prioritize, keep, and drop resources. I hope you will play with the tool and comment – here or in the shared Google document – on its accessibility and its usefulness in your contexts. Engagement: how much do you engage with this person, organization? Network value: how much do you value the networks of others connected to it? Reputation: rate the person’s or point’s professional reputation. Trust: to what degree is the point trustworthy? Like-mindedness: while it’s not difficult to imagine why a person might network with different-minded people, this study found strong correlations between high value and high like-mindedness among networkers. Collaboration: how strong is potential for collaboration with or within it? Learning: what is the potential for learning in connection with this point? Connectivist philosophy presupposes a human capacity for learning that predates the technology we now have for realizing a greater capacity through connected learning. If a constraint on current capacity is the model of funneling knowledge through one instructor/professor at a time to students, PLNs show a way to improve on that model. So that knowledge might reach learners through a shower head instead of a funnel, we’re exploring ways of infusing the building and maintaining of Personal Learning Networks into the Writing Studies MS program in Scientific and Technical Communications (S&TC) . Forgive the mixed metaphor, but whether knowledge is fire or water, we have to step down its intensity somehow and that’s what PLNs enable learners to accomplish within large institutions and in self-directed learning. One goal in an MS program that serves researchers, teachers, learners, and employers in technical communication fields is for research and teaching and learning and practice to inform each other. We believe reflecting on PLNs in the ways I’ve described supports that goal in unique and valuable ways. 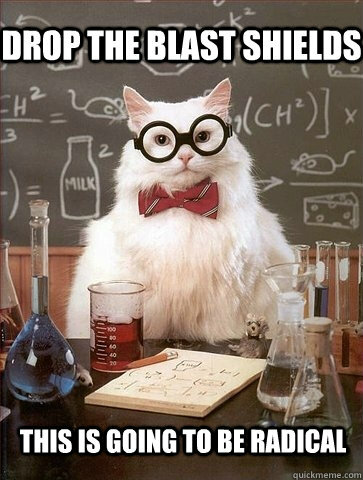 Chemistry Cat’s take on blast shields. National Research Council. How People Learn: Brain, Mind, Experience, and School: Expanded Edition. Washington, DC: The National Academies Press, 2000. http://www.nap.edu/openbook.php?record_id=9853&page=31. Rajagopal, K., Joosten-ten Brinke, D., Van Bruggen, J., & Sloep, P. B. (2012). “Understanding Personal Learning Networks: Their Structure, Content and the Networking Skills Needed to Optimally Use Them.” First Monday, 17(1), 1–12. http://firstmonday.org/htbin/cgiwrap/bin/ojs/index.php/fm/article/view/3559/313. For more on the interdependent and interactive roles of Expert Learners / Skilled Orienteers and Novice Learners / Liminal Participants, see the earlier TILT post on Liminal Participants and Skilled Orienteers.